It's the Day of the Dead and there is a family with a sick little girl who is celebrating. Meredith, DeLuca, and Alex are on the case. She has a crush on DeLuca, so when it's time to do her surgery DeLuca opts out of it because she doesn't want him seeing her so vulnerable. Richard tells Meredith that Thatcher is sick and that he doesn't have much time left. Meredith shares with Maggie, and everyone tries to make sense of how she chooses to react. 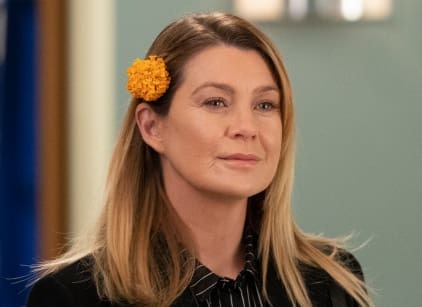 Jo encourages Link to pursue Meredith, but Meredith keeps shooting him down. Levi is assigned to work with Link and Nico on an ortho case. He discovers cancer in the scan, and Link has to tell the mother that her son is sick. She flips out, but he tells her about his own experience with cancer as a kid and that he's proof that her son will likely live. He then cuts some of his hair to support the boy. Meredith goes on her date, but she scares him away ranting about her father. Jackson caters to Maggie to make things up with her, and she's spending the day thinking about her mother. Teddy sits down and talks with Owen. She doesn't get to tell him about the baby because Amelia comes in and she's freaking out because Betty is missing. Teddy spends the rest of the day helping them look for her, but they don't find her. Bailey finds a way to make a liver that died viable for her patient who has been passed up multiple times on the list and needs a liver before she dies. It's a success. Jo had to go against Alex to make it work, but he's impressed with her. Nico kisses Levi, but when he finds out that it's Levi's first time being kissed by a man, he backs off because he doesn't want to be with someone inexperienced. Andrew and Link flirt with Meredith. After talking with her young patient's grandmother about Day of the Dead, she thinks of all the people she lost. She sees visions of Derek, Lexie, Mark, Ellis, and Doc in the hall of GSM. She goes to Alex's house to clear her head, but Link is there. She cuts his hair for him. Richard: He's in hospice Meredith. He has only a few weeks to live. Meredith, did you hear what I said? Meredith: Yes. Thatcher is dying. I got it. Thank you. Permalink: Yes. Thatcher is dying. I got it. Thank you. Richard: When is the last time you spoke to your dad? Meredith: Thatcher? Um, when Lexie died. I think. Why? Grey's Anatomy Round Table: Did That Touching Tribute Steal Your Heart? !